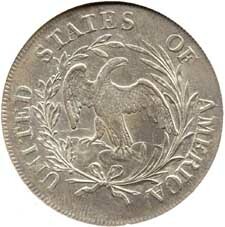 Similar to the 9x7 stars/large letters sub-type, 1797 dollars of the 10x6 stars/large letters type are fairly readily available, relatively speaking, and in particular, are somewhat more available in higher grades than the 9x7 stars/large letters sub-type. 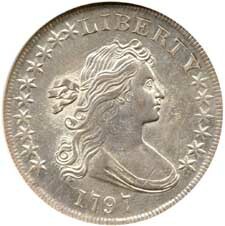 Like other dollars of 1797, these coins do not generally show much luster as all, and the typical strike quality is really quite poor. Here again, it becomes a daunting task to attempt to locate a specimen with a nice strike and pleasing appearance. Superbly sharply struck at the peripheries, the Cardinal specimen exhibits a bit of the central strike weakness that plagues this date. This can easily be overlooked, however, as its booming frosty luster literally jumps from the lightly toned surfaces, truly setting this exceptional specimen apart from the others seen.